Connie Haines Hutchinson, a Herndon native, served seven terms on the Herndon Town Council. First elected to the council in 1992, she served as Vice Mayor during the 2008-2010 term and again in 2012-2014. Hutchinson served on the Virginia Municipal League's Legislative Committee and has chaired its General Laws committee, and been a member of its Community and Economic Development committee. In 2009 Hutchinson achieved designation as a Certified Local Government Official of the Virginia Elected Officials Leadership Academy, and she completed the Virginia Mayors Institute, sponsored by VML and the Weldon Cooper Center for Public Service. She served as President of the Dulles Area Transportation Association (DATA), and served on DATA’s board of directors from 2008 - 2014. Prior to her council service, Hutchinson served on the town’s Architectural Review and Heritage Preservation Review Boards. She has been actively involved in community and youth sports programs in Herndon, serving on the board of directors of the Herndon Optimist Club and Herndon Recreation, Inc. She also served as president of Herndon Youth Soccer and the Herndon Elementary School PTA, and as vice president of the Herndon Middle School PTA while her four children attended Herndon schools. 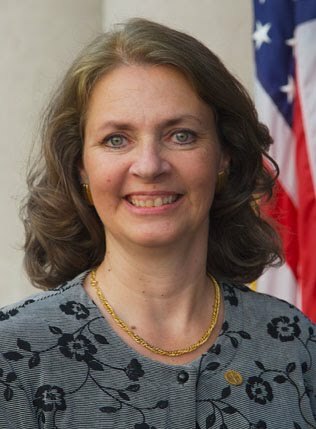 From 2001 until 2010, Hutchinson served as Executive Director and President of the board of directors of the Herndon Dulles Visitor’s Center, a non-profit organization of which she was a founder. In this role and on behalf of the Town, she served as a tourism related representative to the Visit Fairfax Marketing Advisory Committee, an advisory group to the Fairfax County Convention and Visitors Corporation comprised of hospitality industry professionals and tourism officials at county sites and attractions. She also served this group on its Visitor Services Committee. Additionally, Hutchinson served on Fairfax County’s ‘Virginia 2007’ Community Program Citizen Planning Committee and was co- chair of its Public Information Subcommittee. She was also co-chair of the Herndon, ‘Virginia 2007’ Community Program Committee and was appointed by the Fairfax County Board of Supervisors as the Dranesville District #2 representative to the county’s History Museum Citizen Advisory committee. She is currently Treasurer of the Herndon Hospitality Association, a 501c6 not-for-profit she founded to assist the Town's hospitality industry; which produces the popular JamBrew free outdoor concert series on the Herndon Town Green in September. She currently serves as General Manager for a marketing, advertising and public relations company in Fairfax, Va. as well as serving as Business Manager for another marketing firm in Manassas and has four grown children and seven grandchildren.